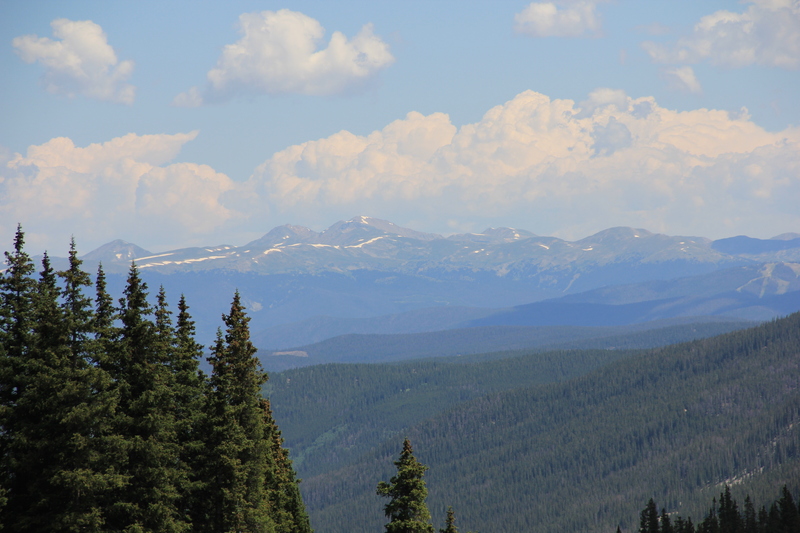 The Colorado Rocky Mountains were formed about 80-55 million years ago…….then the first village was built, 1851. 13,000 years ago the eastern edge of the Rocky Mountains was a major migration route that contributed to the spread of Paleo-Indian peoples throughout the Americas. There is little reason why early people would have ventured far into the higher mountains as large and small game was abundant and easy to follow on the more temperate grassy plains. It was not until about 2,000 years before present that human habitation took hold in the Rockies. At that time Ute Indians ranged across the western Colorado Plateau and a few nomadic Ute bands hunted the southern mountain valleys. 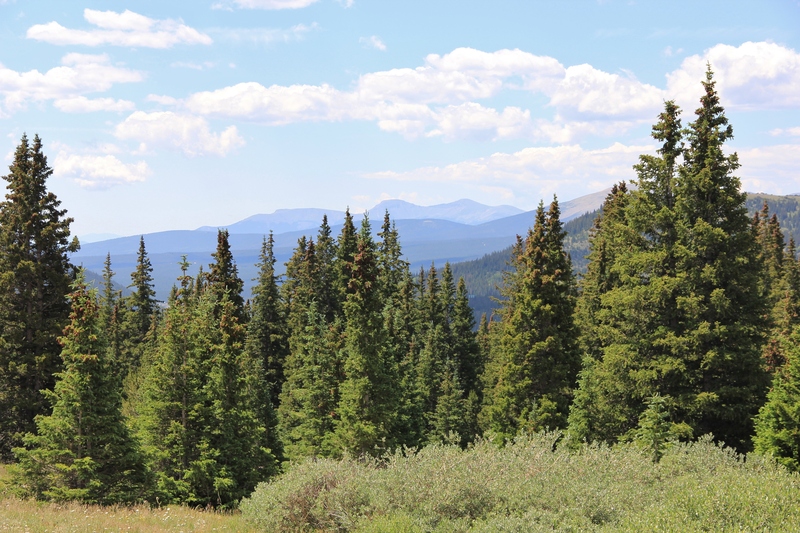 Except for occasional hunting trips the high Colorado mountains were never inhabited, ever, until just over two hundred years ago, around 1800. In the later part of the 18th century the newly established United States of America was rapidly expanding its territory westward and had reached the Mississippi River by 1800. Through the sale of the Louisiana Purchase from France in 1803, the United States acquired a territorial claim on land that stretched along the eastern flank of the Rocky Mountains clear to the Canadian border and nearly doubled the size of the new country. Eager to learn if a water route to the Pacific Ocean existed President Thomas Jefferson commissioned the Corps of Discovery Expedition (1804-1806) to explore the uncharted West, establish relations with Native American tribes and keep a scientific journal of plants and animals found along the way. Led by Meriwether Lewis and William Clark the Corps of Discovery went by river, forest and mountain and through a completely unknown wilderness, the first to map a northwest route across the continent to the Pacific (no water passage was found). They returned with information about some 300 species unknown to science, had met nearly 50 Indian tribes and ‘discovered’ the Rocky Mountains. The U.S. Army organized a reconnaissance expedition in 1806 to explore the southwest portion of the territory acquired by the Louisiana Purchase. Commanded by Zebulon Montgomery Pike the party crossed the Great Plains and reached the Rockies in November that year. Confused in their bearings while searching for the Red River the men crossed over the Front Range and high peaks to the San Luis Valley. Spain had long claimed sovereignty to the Rocky Mountain chain and all lands west to the Pacific Ocean. Pike and his men were found on the foreign soil by a troop of Spanish soldiers, captured, escorted to the Governor in Mexico and accused of being spies. Several years after his release Zebulon Pike wrote his recollections and insight to the regions geography, population, political climate and the potential for trade. His book contributed directly to the development of the Santa Fe Trail. In the wake of the various 1806–07 published accounts of the Lewis and Clark expeditions‘ and driven by the lucrative earnings available in the North American fur trade , a migration of backwoods entrepreneurs started arriving in the Rockies for the purpose of establishing a fur trapping business to compete with the entrenched companies. 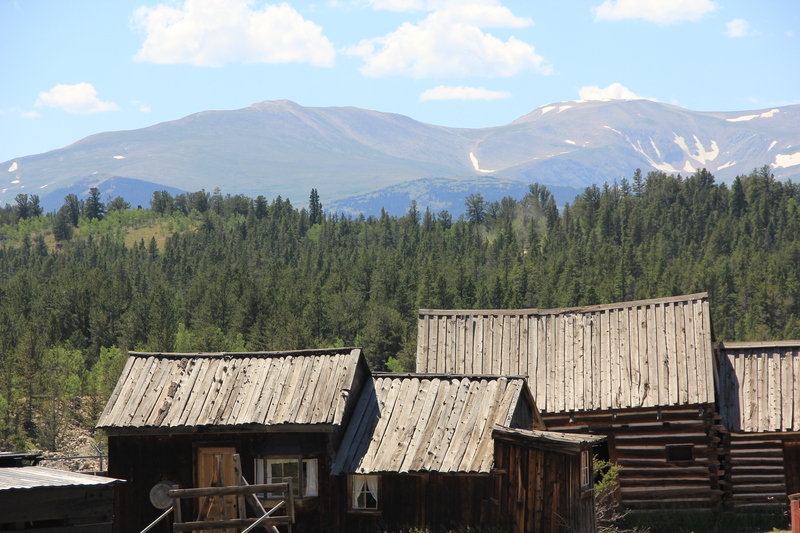 In the early 1800s, Colorado was an unknown expanse of wilderness. The first accounts of the mountain region come from adventuresome beaver trappers and explorers who explored its valleys and forests, established forts, encountered American Indians, and drew the first rough maps. The trappers and mountain men covered vast distances in their search for beaver and fur and their knowledge of mountain passes and trails made it possible for military and civilians to later follow these routes west to California or Oregon. The men that migrated to the mountains evolved to sustain themselves solely from the environment and adopted customs peculiar to their circumstances. They had to be skillful woodsmen to supply all their needs of food and shelter while wandering the mountains for months at a time. Clothing was fashioned from buckskin and hide moccasins for the feet meant items could be repaired or replaced with new animal skins when needed. Much knowledge was gained and lessons learned from various Indian tribes. The men had to be totally self sufficient and also be capable of prolonged periods of solitude, confront dangerous animals and hostiles, suffer sickness and privations and every type of extreme weather imaginable. Mountain men were most common in the North American Rocky Mountains from about 1810 through the 1840s. While there were many famous free trappers, most mountain men were employed by major fur companies. The peak of the beaver harvesting period was between 1820 and 1840 when approximately 3,000 mountain men ranged the Rockies. Beaver fur eventually fell out of fashion, demand dropped and profits vanished as did a dwindling beaver population. Bill Williams, a trapper/explorer, returned home to Missouri in 1841 with a small sack of gold nuggets he discovered somewhere in the Colorado Rockies.The mountain men having built no towns, villages or even homesteads, drifted off or found employment as scouts and trail guides. Colorado’s first permanent European settlement was founded April 1851, when a few Hispanic settlers from Taos, New Mexico, built a small village in the southern part of the San Luis Valley. It strikes a thought, when I think that I was born just less than a hundred years later. One hundred years is not that much time for all that has happened. In the first week of July 1858, William Greenberry Russell, his brothers and a few companions found a small placer deposit of gold at Little Dry Creek near present day Denver, Colorado. The prospecting party had come from Georgia to investigate stories told by Cherokee family members. The Russell brothers panning and sifting the sands extracted about 20 troy ounces (622 grams) of gold. 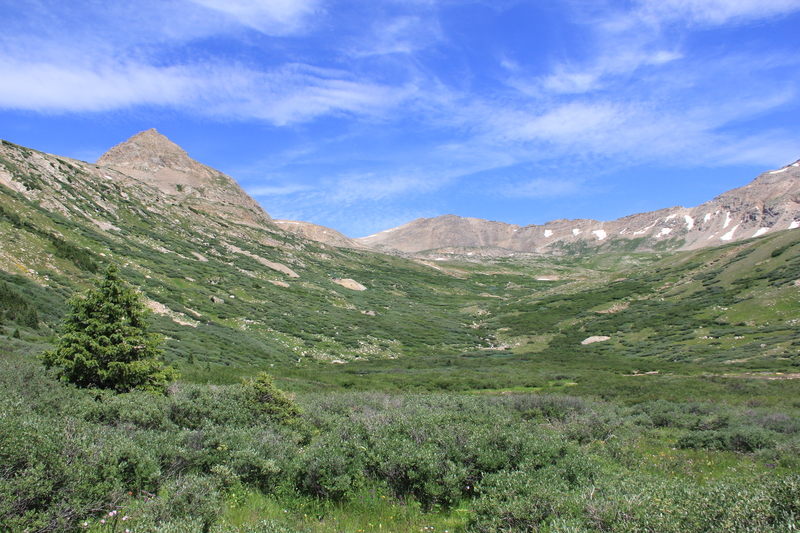 This was the first significant gold discovery in the Rocky Mountain region. News of the discovery reached Kansas City from an old trader, soon spread and sparked the Pike’s Peak Gold Rush. Prospectors searched along the South Platte River, Cherry Creek and other streams east of the mountains that year but placer deposits on the plains were small. A few of the more daring and determined of those early prospectors began searching for the gold flakes in the cold canyon streams that led up into the mountains. On January 7, 1859, George A. Jackson, a cousin of mountain man Kit Carson, discovered an extremely rich gold placer on a sand bar at present day Idaho Springs on the South Fork of Clear Creek. The strike was so rich Jackson was scooping up the yellow stuff with a knife and a cup. In early May 1859, John Gregory, an Alabama-born mule skinner on his way to Jackson Diggings took a detour instead onto the North Fork of Clear Creek and to his delight followed a trail of color a half mile up a small gulch (later to be named Gregory Gulch). He had discovered a rich vein of gold bearing quartz feeding a placer deposit below with bits of free gold. 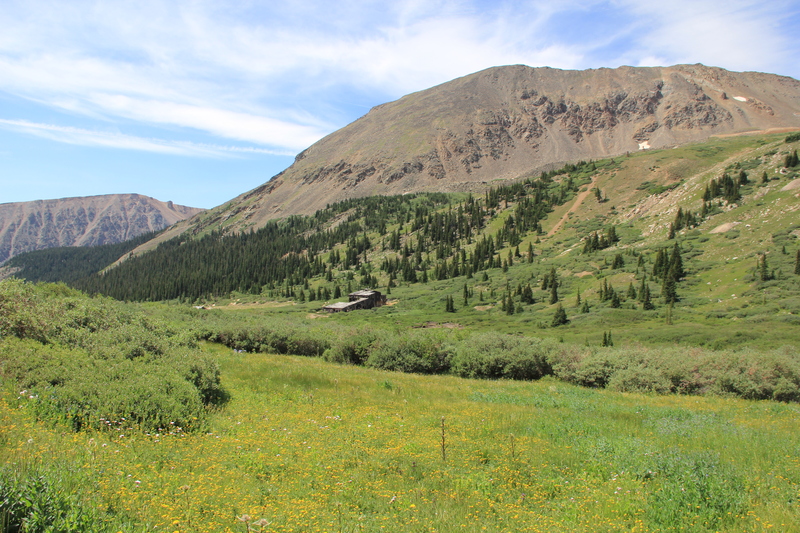 By June 1859, only a month later, over 5,000 prospectors had claimed virtually every foot of the three mile long Gregory Gulch and its gold bearing tributaries. The prospecting miner was as unique an individual as the mountain men who preceded him. The miner was a dreamer and gambler. Independent, transient men with gold dust in their eyes, ready to throw it all in on the hopes of hitting paydirt. He usu­ally arrived at the newest mining camp with a burro or two loaded with all his worldly possessions. With a pick and a shovel and a sack of supplies he would strike out to find a stream or canyon that no man had ever seen before, hoping to find that outcropping of silver or gold. The stories of others discovery of riches only added to the dream. A few struck it rich. Many worked for wage as miners or teamsters or cooks or a hundred other tasks that sprang up with the rapid growth of boom towns. For every once of gold that some miner might wrestle from the ground, there were games of chance, saloons and shopkeepers ready to take it all away. Even when working for others most still expected they could strike it rich and continued prospecting in their spare time, leading their burro across rugged passes and road-less mountain wilderness. The early gold discoveries were at the northeast end of the Colorado Mineral belt, a large alignment of mineral deposits that stretches northeast-southwest across the mountainous part of Colorado. 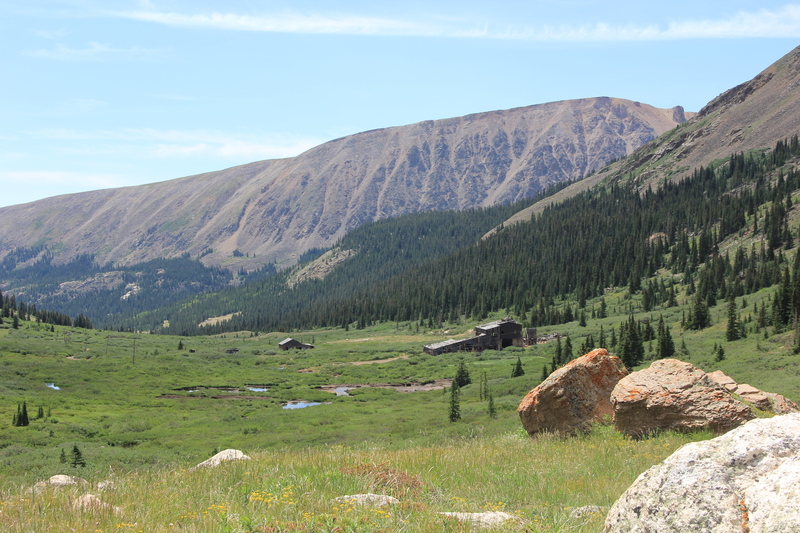 From Idaho Springs, prospectors followed the Colorado Mineral Belt west along Clear Creek, then over the mountain passes to South Park and to the headwaters of the Blue River. The first three years of the gold rush An estimated 100,000 gold seekers flocked to the Rocky Mountains. Many of the men in the different mining districts had been farmers back east, and didn’t even know what they were looking for in their quest for gold. They didn’t know how to pitch a tent or build a fire, it didn’t matter, they had caught gold fever. They ventured through the rugged terrain of the Rocky Mountains often working at elevations 9,000 to 12,000 ft. above sea level. Summers are short there, only two months long. Snow is often ten, twelve, fourteen feet deep. Fierce winds scour the slopes and howl down every trail. Rations are slim and monotonous the housing is a makeshift affair. The only contact with the outside world were pack trains of burros that carried supplies to the more remote mines. Once some kind of road could be built teamsters driving horse-and mule-drawn wagons also brought in supplies and hauled off the ore to local smelters. By the 1870s, railroads connected the larger mining communities to the supply towns on the plains. 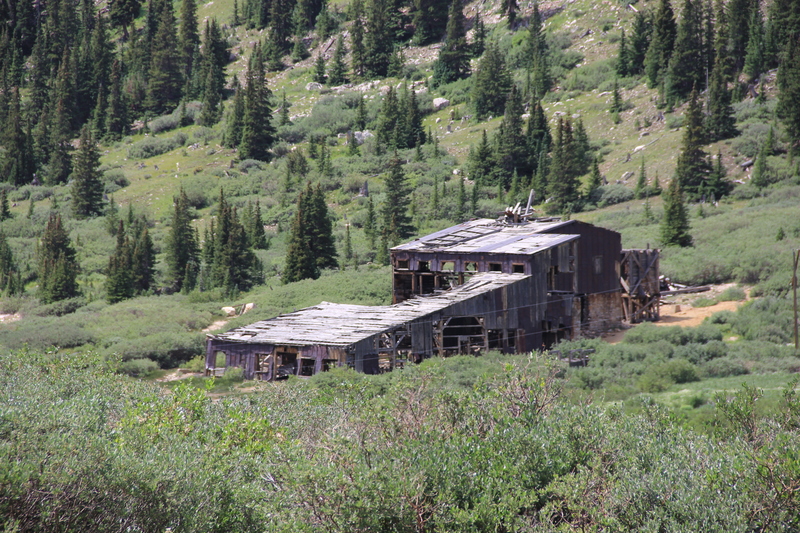 It is a common occurrence to find old iron relics and remains of buildings in remote mountain locations while hiking in Colorado. 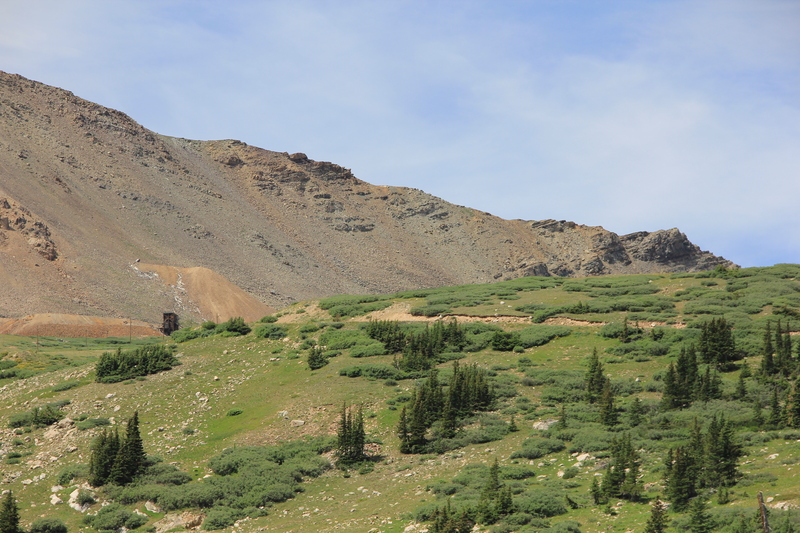 This July I stopped at a mine site located west of Alma, Colorado on the south slope of London Mountain. 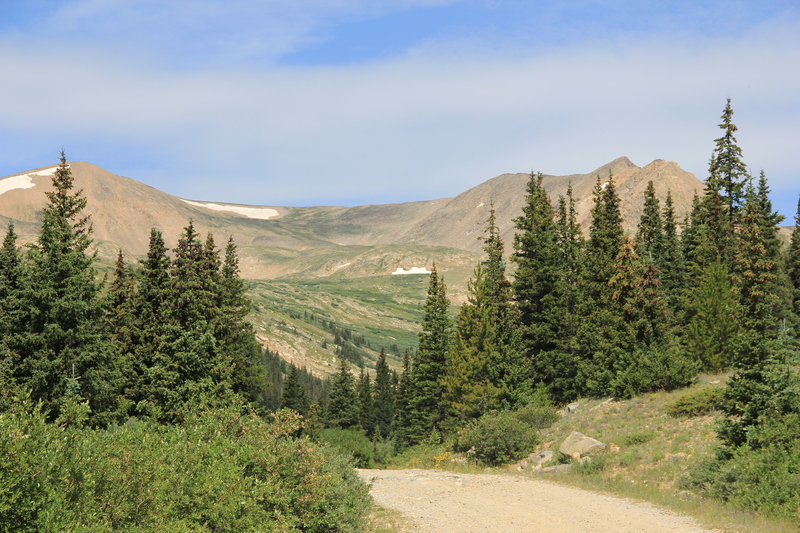 The elevation of London Junction at the top of Mosquito Gulch is near 12,000 ft. On the other side of Mosquito Pass, over the ‘ highway of frozen death’ (elevation of 13,185 ft) is the historic Leadville mining district, one of the richest in Colorado history. The London Mining Company owned the nearby North London Mine, which had been in operation since 1874. A few years after, the company opened the South London Mine. Tenants Stamp Mill was built a thousand feet below the mine at London Junction around 1877 to process the ore from the North London Mine. The day I was there gazing, across the meadow of golden wildflowers swaying, at the brown timbered building, sagging, weathered with the weight of winters, I tried to imagine what it was like, to commute to work to this place, back then. A bullet point chronology of interesting dates/events and Colorado mining history can be seen here: Colorado gold highlights. In the photo above, piles of reddish mine tailings can be seen on the mountain slopes. The brown structure at the left tailings pile is a part of the South London Mine. In 1882 a 3,300 ft. long aerial tramway (the first in Colorado) was constructed to transport the ore from the North London Mine to the mill. During the same year the Denver, South Park and Leadville Railroad completed a line to the mill, which made it possible to ship the processed ore to the smelters by rail. 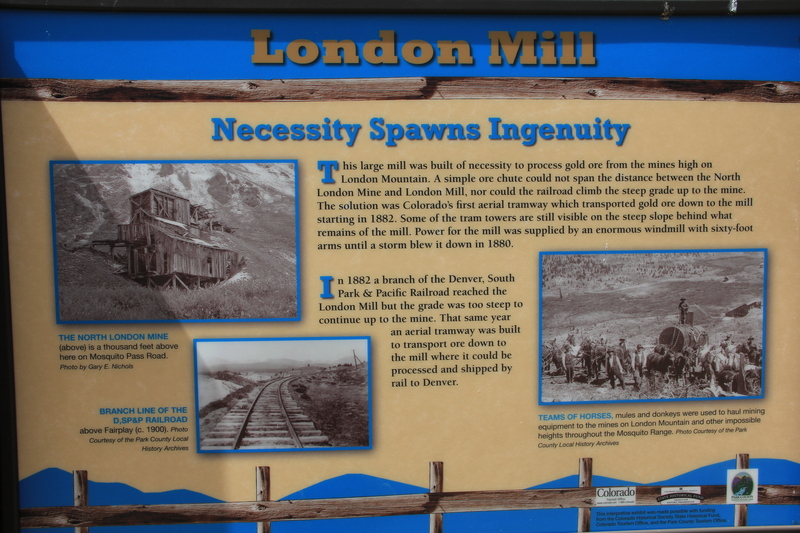 A second stamp mill was constructed at London Junction in 1883, and during the first seven months of operation it produced $124,000 in gold bullion and 240 tons of concentrates, which were shipped to the Black Hawk and Denver smelters. After 1892 the South London Mine became the chief producer, and a tunnel was bored to connect the North and South mines. Between 1895 and 1931 the company’s gross profits were over $9,000,000. The South London Mine was operated until World War II when all gold mines were shut down by the War Labor Board’s Order L-208. The mine’s machinery was sold, and it closed in 1944. In 1800 Colorado was an unknown wilderness, 213 years later, in 2013 it is a wilderness known for it’s hiking, skiing, rafting and recreational activities. This entry was posted in earth, environment, history, local economy and tagged Colorado, hiking, history, nature, photography. Bookmark the permalink. i had a lot of relatives in the rockies fom 1809-present. lots of stories and famous people.everyone should see all of the rockies at least once. That is fascinating, Dohn. I’ve long been interested in the history and development of metal mining but all this is new to me. There are, though, lots of parallels with the exploitation of metal ores in Britain – with the exception of the large quantities of gold, of course. The village in which I was born was built on a wave of iron ore fever in the 1860s, but that industry died in the early 1940s. Strange structures still remain though, and red tailings heaps, to remind the present generations how their ancestors lived and worked. Thank you to share this article…I enjoy to read it, it’s really interesting and the photos are fantastic! Exquisite photographs and fascinating history. Very enjoyable read! the mtns are a living museum with many stories, pleased you enjoyed this one. Gracias. I like the picture, the history was great to read, I don’t agree on the chronology dates, but then I’m a Creationist. Good job done.